Original notes from MONDAY May 31, 2010 with updates from Wednesday June 2, 2010: As soon as I heard about the new Cooking Channel weeks ago, I was looking forward to today’s debut. The shows started at 7am on Monday, May 31st on the old FLN (Fine Living Network) channel. Brought to you by the same company as the Food Network, it’s more about instructional cooking sans all the reality show drama. At least that is how they are starting out. I am really looking forward to watching the old classic shows with Julia Child and the Galloping Gourmet! Looks like they are starting on Tuesday at 2pm. I woke up around 7:30 and started watching. “Chuck’s Day Off” was on. I loved that he cooked simple, easy recipes with fresh, sustainable ingredients. That’s so important now. I liked his personality and will definitely watch again. Next was “Everyday Exotic” – I only watched 2/3 of his first episode at 8am and 2/3 of the next one at 8:30am. He was okay. I don’t know that I would necessarily seek out his show again, but if I saw it was on again and there was nothing else, I would probably watch. I found his humming annoying, as well as how he keeps saying “crazy” or “beautiful” – too many adjectives. Maybe he had just too much nervous energy, and he’ll get better with time and experience. I do like that he takes one main ingredient (papaya, mango) and uses it throughout his recipes. He did offer some good tips. My favorite tip was that he used a pair of tongs to juice a lemon/lime. I am definitely going to try that! UPDATE: I can’t believe the show I wasn’t so crazy about is starting to become one of my favorites. I watched Everyday Exotic a couple of times, and I really like the show now. His personality grows on you, and I am enjoying his recipes. Well, I’m back down to 152 this morning. :D Too funny. I guess I will just float in between 152 and 155, and that is okay. I also might have been retaining a bit of water the last week or so. I stepped up my water intake the last couple of days. I was definitely slacking off for awhile, barely drinking 8 glasses. I am shooting for 11-12 glasses per day now and I think it’s making a big difference. Another problem that I haven’t discussed publicly (here on the blog) is I think I’m in perimenopause; so with a messed up monthly cycle, my moods and hunger pains are directly related to that. I just have to take it one day at a time! Life is good. I am 152! Ha! Even though it could change tomorrow! We’ll see! PS. I had a semi-cheat day yesterday. I ordered take out bowtie pasta and meatballs. Ate 2/3 the pasta and all the meatballs. Can’t pass up good meatballs! Yum. Yeah, life is really good! Author debbie @ That's Just MePosted on May 30, 2010 Categories Weigh inTags feelings, healthy, perimenopause, Weigh inLeave a comment on 152 – ha! Yikes, watching the Super Size Me movie again on Hulu – geez, how bad is this food, but how badly would I love to eat one of those Big Macs. Oh darn, that looks goooood! Morgan Spurlock was speaking to a law professor sitting at a table at McDonalds, and they are discussing how the marketing of the fast food industry is similar to how candy cigarettes were used by the tobacco industry for brand imprinting. Well, I’m officially in “Maintenance” mode. I suppose I’ve been in maintenance for a few days, actually a few weeks, but my body has officially let me know that I am done losing weight, and I am at a healthy weight (154-155lbs) that I can maintain long term. I’ve been driving myself crazy since last weekend. Just feeling so hungry, especially at night, but feeling like I can’t eat because I don’t have enough calories left. I’d sometimes end up going over my allotted 1700 calories by a few because I needed more food…but now, officially allowing the extra 100 calories should help psychologically I think. I think the last few days have been the hardest part of these past ten months. Throughout my whole weight loss journey, I rarely was hungry, except for a few scattered PMSing days. I’ve found “eating clean” was very easy for me. And I’ve been enjoying working out as well, but I think my body needs more fuel. I don’t know what changed, if anything, but somehow what I am eating wasn’t enough. So, 1800 calories should be a good starting point. I will have to take it day by day and see if I need to also eat my “exercise calories” as well. I will continue to monitor my weight every day or two, just to make sure I am not gaining. So far, most days I am 154.4 pounds, and my body seems to be happy with that number. I just heard about soaking onions in ice water (or milk, which we usually don’t have much of in the house) to cut down on the onion’s “bite”. Gotta try this next time. I just love onions, but sometimes, yes, they are so strong! Thanks Kalyn’s Kitchen for your tip! Made a new bread this afternoon. Just had a slice, and it’s hearty and wheaty tasting! Modified from my regular 100% whole wheat recipe that I based on the Walnut Whole Wheat Bread recipe from King Arthur Whole Grain Baking book. 12 oz or 3 cups – mixture of traditional and white whole wheat flour. Driving north for the first RV/camping trip of the season, I’m feeling vulnerable. Feeling like I could fall backward into my old ways of eating eating eating. I don’t want to gain but there’s a part of me that’s feeling like who cares? Just eat. Reward yourself, you’re on vacation! My confidence appears to be fading. I am trying to hold on. If I can get through this weekend then I will feel so much better! UPDATE #1: ate dinner at Wendy’s. Think I’m doing better! I might have just been hungry! UPDATE #2 MONDAY May 24, 2010: Well I got through the weekend. I don’t know why, but I was hungry most of the time. Could it be that we were more active? We burned a lot of calories biking and walking. I don’t know what came over me. It was like a psychological curtain was lowered, and I was famished. It started with the drive up north and continued through the whole weekend until driving home. Once home, it’s like the curtain went back up, and I was normal. Thankfully, I didn’t eat anything regretful. Lots of fruits and whole foods. We ate dinner at a restaurant on Saturday night, and I ordered broiled haddock (no butter), rice, zucchini w/ stewed tomatoes and also a wonderful salad. I dipped my fork in the dressing instead of pouring it on top. It was delicious. 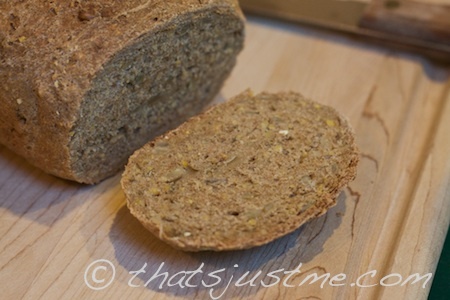 My only downfall was that I ate about 4 slices of their homemade whole grain bread, but it was soo good. I am wondering if I should weigh myself this AM. My microwave usage has gone way down since I started eating cleaner. I am not necessarily afraid of the “microwaves” emoting from the microwave, but I don’t think it cooks food quite the same as on the stove or in the oven. I think it kills a lot of healthy nutrients. 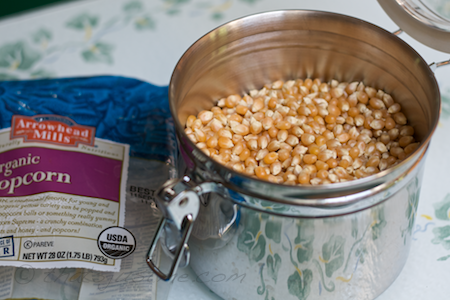 But I was intrigued to try homemade microwave popcorn. And I was surprised how easy it is! Healthy too! I like purchasing organic popcorn, mainly because it’s free of pesticides and it will not be grown from GMO (genetically modified) corn seeds. I found the Arrowhead Mills brand at Whole Foods. Check the organic isle at your local grocery. Whole Foods also carried bulk organic popcorn if you don’t want to commit to a full bag. Finally got my copy of the book “Eat This And Live” by Don Colbert from the library. It was suggested to me by one of my FB friends, and I was on the waiting list for months. Bottomline: this book is NOT recommended. Let’s start with the positive. I borrowed a copy of the King Arthur Flour Whole Grain Baking: Delicious Recipes Using Nutritious Whole Grains book and I loved it so much, I have renewed it three times. I found the Yeast Bread section extremely helpful in learning more about baking whole grain bread, and I successfully baked using their “Walnut Whole Wheat Bread” recipe twice, and will continue to use this recipe going forward. I didn’t bake yet with nuts, but I mixed in rosemary once, and poppy & caraway seeds the next time. I use a bread machine on the dough setting (per their recommendation) to mix and knead the bread, and perform the first rise. It works very well. I just love this book, and I might end up purchasing a copy for myself. It’s really an invaluable book if you are just starting to bake bread. They explain the basics in simple terms, and I really started to understand the complex world of bread! Besides bread, there is a ton of other whole grain recipes: puddings, muffins, cookies, cakes, pies, crackers, and flat breads (just to name a few). There is even a section on sourdough. 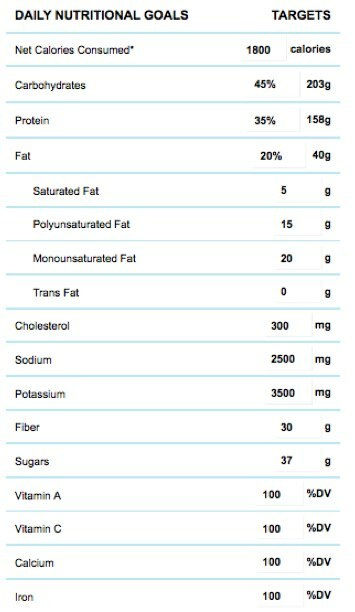 The last section is about the actual details of each whole grain. I have never been much of a baker. All the required accurate measurements feel so restraining, but since I am getting so much better with bread baking, I feel more confident to delve further into other aspects of whole grain baking. I will update the review if I do decide to buy a copy for myself. I am still reading several other whole grain bread books, & haven’t decided which one I love the most. The King Arthur Flour Whole Grain Baking book is definitely in the running!